But Cutty’s needs to be recognized on this blog as an example of simplicity at its best. A Cutty’s sandwich is just a sandwich. It’s not served with a side of frisée or frites, and it cannot be ordered with a fried egg topper. Ingredients aren’t piled a mile high, and sauces don’t splash out the sides. What makes the sandwiches special is their flavor combinations that are familiar yet finessed. Each component is prepared expertly and carefully. While I’ve eaten my way through almost every sandwich, salad and dessert and have re-ordered all of those, I thought I’d highlight just two items: the expected and the unexpected. 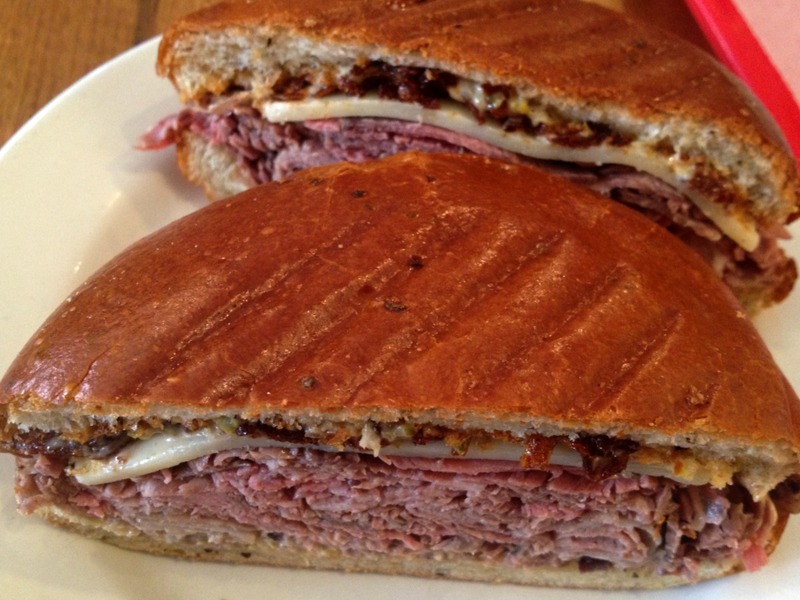 The Roast Beef 1000 at Cutty’s needs no introduction. It is the most pilgrimage-inspiring item on the menu, even though it wasn’t the sandwich from which owner Charles Kelsey planned to receive his fame. It’s simple: the meat is done right. It’s dry-salted overnight to ensure succulent, juicy meat when slow-roasted. The peppery outer ridge is just as pleasing as the medium center. Shallots are fried to crisp perfection and add a subtle bite and a nice contrast to the modest mountain of tender meat and soft slice of cheddar. The most surprising part for me is the housemade thousand island dressing that is smeared on the bun. As a Dijon devotee, I was skeptical, but I love how the light sweetness doesn’t become overly aggressive when coupled with the sharp cheese and how the tang brightens the buttery richness of the beef. It’s held together with a brioche bun from Iggy’s that has a sturdy, shiny crust but that is soft and not too cumbersome. 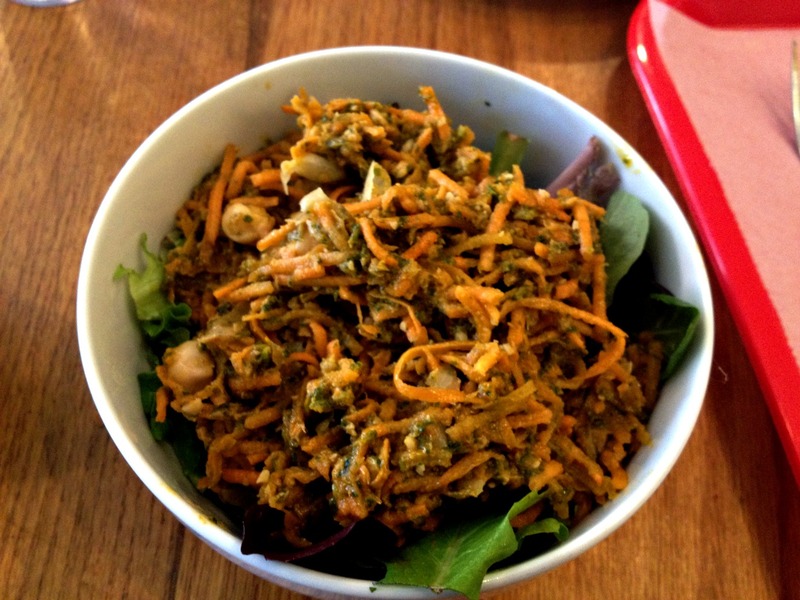 For me, the unsung hero of the Cutty’s lineup is the Chickpea Carrot Salad. The salads at Cutty’s are actually good enough to make me take a break from their lunches served between bread. This one is truly unique. Crunchy grated carrots are intertwined with creamy chickpeas. Their sweet and nutty flavors are kicked in the rear by a zesty and liberally spiced dressing, or rather, marinade that’s peppered with cilantro and finely ground almonds that make it pleasantly gritty. It’s served very cold (most likely from the fridge), but I like to let it sit for a little, so I can really appreciate the earthy flavors. Expected or unexpected, I have yet to have a breakfast bite, lunch special, sandwich, salad or baked good that hasn’t been utterly simple but completely stellar from my friendly neighborhood sandwich shop. Yum. I love your analogy–isn’t that always the case with dessert tables? Oddly enough, this is the second blog I’ve read this morning about the beauty of a simple sandwich. Sandwiches really are the perfect food to me…but that salad looks dang good, too. I’ve always wanted to try that salad! I haven’t been in forever. I’m partial to the greens shallot and the brown sugar cookies. I love Cutty’s! I haven’t tried the roast beef yet. I usually get the spuckie or eggplant spuckie when I go. And when they had it as a special, I got the fork-and-knife grilled cheese a couple times. Oh and the breakfast sandwich–the breakfast sandwich is incredible. I haven’t been disappointed with anything I’ve tried. Everything is so good! The knife and fork grilled cheese (with bacon) was probably the best thing I’ve had there. The tomatoes were amazing! The spuckie is a favorite of mine, but I haven’t had the eggplant version. I actually haven’t had a breakfast sandwich yet, so I need to get on that! I’ve never been to Cutty’s, but it sounds great. I know where I’m going the next time I’m in the neighborhood!